This is another zombie emote from my emote pack. They horde with the single goal of finding and eating you. Hi! I used this in one of my fan fics. I hope you don't mind that the hero defeats the monsters in the end! Not at all. Hordes gotta die. You're right, the heroes have to win, otherwise we are all doomed! ZOMBEH ATTACK!! GET SOME!!! GET SOME!! Just to let you know this emote has been featured in volume 103 of So i herd u liek emotes?? 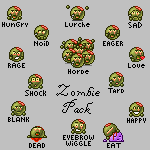 I just think you should have made few zombie emotes not copy paste them all in one emote. Yeah, I thought about that after I finished this...but I had already done it so many times just to get the timing right, I just couldn't make myself redo it again. I might go back and revisit this idea, tweaking it so each zombie is unique. Those are party zombies, aren't they? Did somebody activate a car alarm!? I like Left 4 Dead. I shot the blinky car!! Aw man, you're getting left out of the safe room! And don't think I'm coming back to revive you either. I deserve it! It was a newb move. Ahhh, I knew there was a reason that I watch you. It's not the awesome crocheting, or emoticons. It's the Left 4 Dead references.